Echolink nodes like G0EMM-L are applied for online and usually within 48 hours you have permission to go on-air, as the system is 'attended' ie you are present you do not have to ask for site clearance and state the switch off procedure - thus anyone can set up an attended link, allowing them to use echolink around their home. Thanks, Keith. I must have found the wrong form. I'll have another go. Like you I thought an Echolink node would require quite extensive permission. I will be interested to see how you get on if you apply for an 'attended' one. I have yet to see any evidence which shows that D-Star is better than echolink or EQSO for that matter. D star seems very restrictive in that you must purchase Icom equipment to use it. Echolink is open to everyone. Neither are I suppose "real Radio" but at least there is an RF element to them although I suppose Echolink could be used for PC to PC conversations. I agree with you on D-Star Julian. In my opinion, the creeping in of proprietary systems is detrimental to Amateur Radio. It all seems very nice until the "owner" of the intellectual property decides their bottom line needs boosting. The digital voice debacle over the melp dll in windrm etc is a case in point. As hams, we should be running, not walking, away from these types of accommodations. Frankly, it is not in the spirit of ham radio to condone proprietary protocols. Once established these systems act as a fire-hose on new innovation and lock themselves into the status quo. With all the talent in the worldwide ham community, and all the innovative programs already produced (for example: HRD, Digital voice, SDR's etc. ), we should respectfully ask these companies to stick to hardware for us. Julian. I'm actually a big fan of IRLP and if you plan to put up some sort of system would really recommend that you have a serious look at it. IRLP is keeping the radio in ham radio! Unfortunately lots of people have just grabbed the new "toy" D-Star to play with, without thinking about the proprietary aspects - somewhat reminiscent of what happened with a certain digital mode recently. EchoLink can be used for PC to PC conversations but that isn't really what it's for. That aspect doesn't interest me at all and many node and repeater operators have actually banned direct computer connections which I completely applaud as being in the spirit of preserving the use of radio. Making the contact from a hand-held using an RF link of a few metres may smack of cheating but it does involve using your radio privileges. There is even the opportunity to build a simple low power transceiver to use at the computer end using something like an MC2833P for the TX and its companion chip for the RX. That's certainly real radio and something I'd definitely do if I found it useful enough to make regular use of it, rather than tie up an FT-817 for such a task. I've found the right form and applied for an attended NOV using low power on 2m so we'll see what happens next. Hi Jeff. Thanks for your comment. EchoLink is free software that runs on Windows and you can just run it when you need it. IRLP appears to run on Linux and also appears to be payware or at least donationware. I'm sure IRLP does have some advantages if you are trying to set up a robust permanent node but as a solution for someone who would just like to make some ham radio contacts now and again using a handie from around the house or the garden in an area where VHF is normally devoid of activity it looks to me like overkill. I enjoy D-STAR . I am not in the range of a repeater . 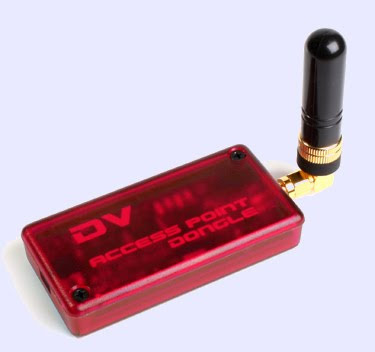 I use a DVAP . It is another way to enjoy ham radio .